I like to try many different snack foods, chips in particular. Snikiddy makes snack foods that are geared to be a bit healthier. 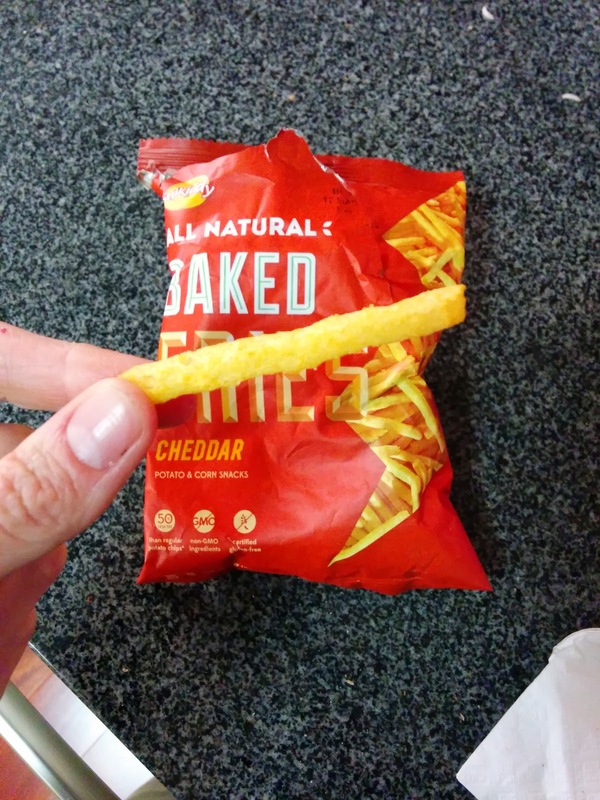 Their product lines include baked fries, cheese puffs, and chips, although all take a healthier slant. All of the offerings are gluten-free, non-GMO, contain no corn syrup or preservatives, etc. The "fries" are really puffed potato and corn snacks. And they are baked, not fried. Don't go into these expecting anything remotely fry-like, the only part the lives up to the name is the fact that they are shaped like fries, and I guess, they do contain some potato. Available in six flavors, of which I tried three. Hot & Spicy Baked Fries. I started with the intimidating sounding "Hot & Spicy" variety. They had a really strange consistency, like a cheese puff, but crispier. The sorta reminded me of eating air. But the flavor was good, spicy for sure. I still wouldn't get them again. Next, I went for the cheddar version. 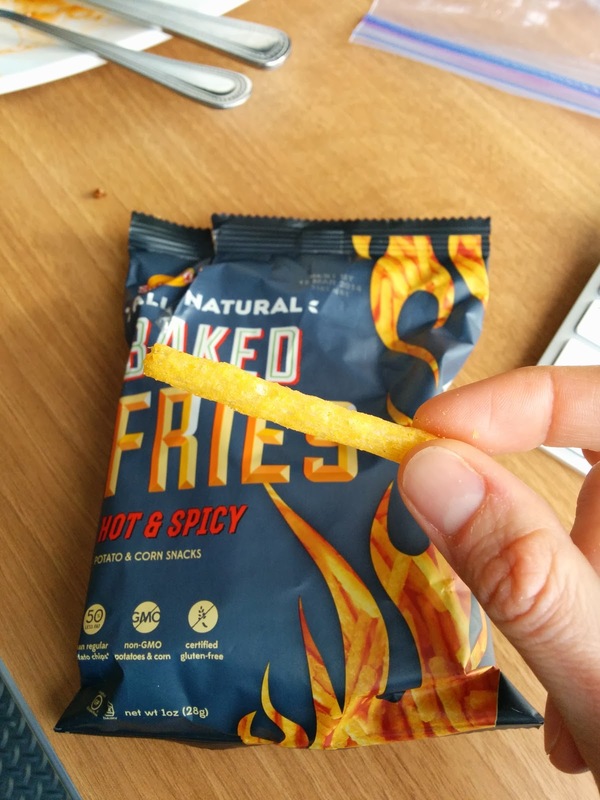 Just like the hot and spicy version, they had a really strange consistency, something like what I imagine a packing peanut would be like. The texture just threw me off too much to enjoy them, and I didn't really taste any cheddar either. I liked the hot and spicy version more, but I wouldn't get either again. These were my favorite. They still had the same strange consistency, but were crazy zesty and totally addicting. I finally got the chance to try the second of Snikiddy's product lines, the baked puffs. Another healthy product line, and yes, gluten-free, non-GMO, no hydrogenated oil, no HFCS, etc. Much like the baked fries product line, the baked puffs line sounds pretty amazing. Mac N' Cheese flavored. Grilled Cheese flavored. I like Mac N' Cheese. I like Grilled Cheese. Although, to be honest, I was a bit confused how that was supposed to translate into puffs, exactly. "Simplicity at its best! Baked with mild cheddar cheese, these creamy baked corn puffs will put a smile on your face!" I went for the Mac N' Cheese ones.They were ... boring. Just corn based cheese puffs. I'm not sure what I was expecting to be honest. What would be mac and cheese about them anyway? 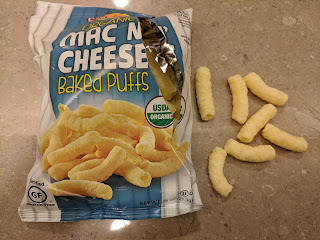 Airy, light, slighly cheesy, puffs. No worse than any others, but nothing special here. Snikiddy makes chips, but they are a bit different, stuffed full of 3 types of beans (navy, red, and black), and eight different vegetables (sweet potatoes, potatoes, carrots, kale, spinach, broccoli, tomato, mushrooms). They come in five different flavors, but I only tried two. Sea Salt: these had a really hearty flavor from the veggies, and were pretty good. The salt level was good, but otherwise I did find them a bit lacking in flavor to just eat plain. I wanted something to dip them in. The next time I wound up with a bag of them, I decided to try dipping them in eggplant dip, and that turned out to be a great combination. Who needs regular chips and dip when you can dip veggie chips in more vegetables? It really did work, and I'd gladly do it again. Sour Cream and Onion: Since the sea salt seemed a bit plain, I also tried the sour cream and onion. The hearty veggie flavor was too strong though, and I didn't really taste sour cream or onion, and they seemed a bit strange to dip into other things. I preferred the plain sea salt over these. Asian desserts. Not something I get to have a lot of as my normal stomping ground of San Francisco doesn't have many in my neighborhood, but I recently took a trip to Pasadena, and was OVERJOYED with my options. So many. I picked Milkie & Snowie because of the strong reviews, and most unique items. It was also a chance to try something I've somehow not had before! Snow! I know its a thing, but it has never made it to the top of my list. Until now. I'm glad I went. I did appreciate trying new things. The service was formal and strict in a strange way though, modifications and customization not accepted. Not friendly, not engaging, just, "I'm here to make your thing, don't make this hard, kthxbye" is the vibe I got. I probably won't return, but it was a memorable experience, and I'm glad I visited. 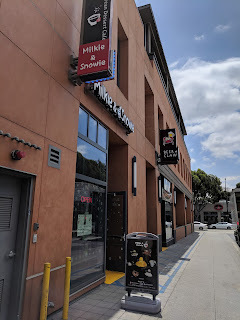 Milkie & Snowie is located in an alley between two of the main streets in Old Town. It might look out of the way, but there are tons of other cafes, poke places, etc on the alley. The other establishments all have outside seating on the sidewalk, but, Milkie & Snowie does not. The only thing they have is a sign with pictures of their top creations. I'm not sure I would have been drawn in if I weren't seeking it out already. No one else seemed to be either. 12:30pm and not a single guest. I didn't take this as a good sign, but I still entered. 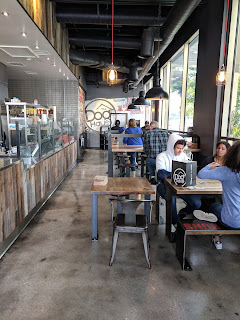 The interior was clean, wooden tables, metal stools and wooden benches, and an ordering station in front. Self-serve water with plastic cups, paper napkins, and busing station on the side. The menu of course is why I was there. So many amazing things. 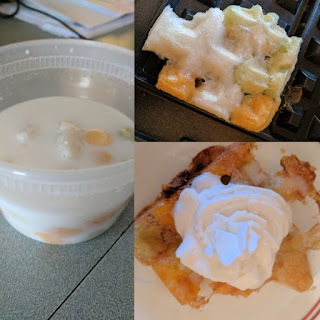 Asian toasts, with mochi inside and fun toppings. Waffles, with mochi inside and fun toppings. Fresh made-to-order taiyaki, with fillings (red bean, nutella, custard, etc), topped with ice cream. Milk tea. Coffee. Scoops of ice cream in great flavors. And, the signature snow based bingsu. So many options I'd gladly try, but, I had to narrow it down to one item, particularly as they are all large, and I was alone. Which was fairly impossible. Even just picking that I wanted bingsu was a hard enough decision, then I had to pick which one I wanted. No option to build your own or customize much. Which was a problem for me. 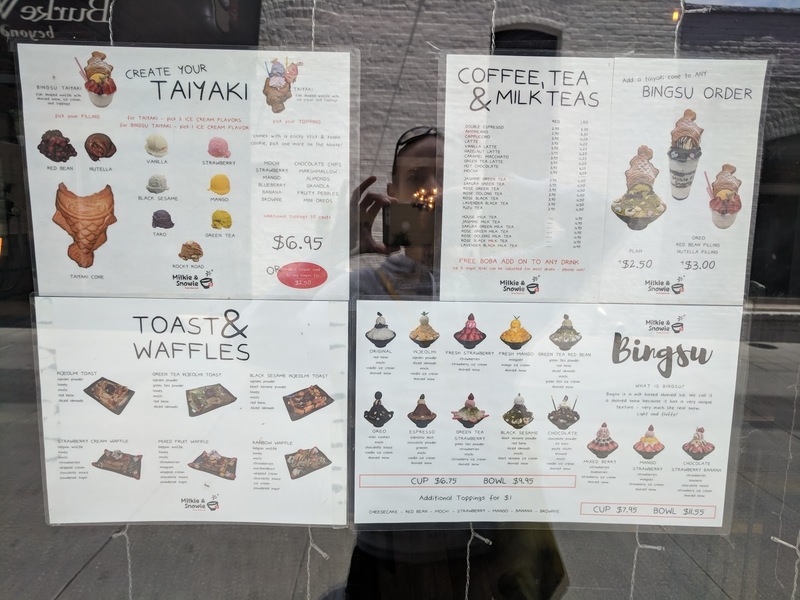 I wanted the black sesame one, with black sesame powder, red bean, mochi, black sesame ice cream, and more. I wanted the taro one, also with red bean and mochi, but had taro powder in place of black sesame powder, red bean mochi instead of sesame mochi, and cereal instead of almonds. I wanted fresh mango. I wanted some combination of these three. But, I was told pretty clearly that wasn't an option, because, "it wouldn't follow the formula". In the end, I did get a slightly customized version of the black sesame Bingsu, with elements of the taro one, and elements from the mango one. It was quasi-successful. 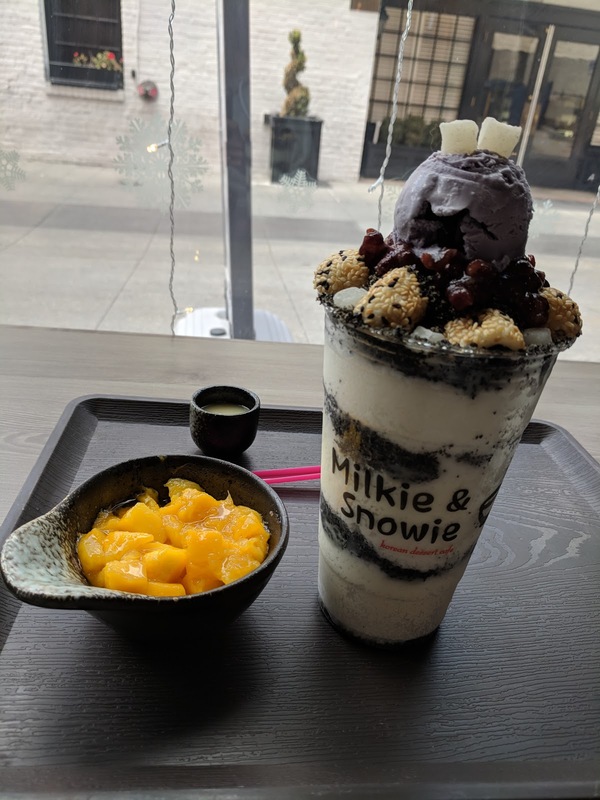 Black Sesame Bingsu (Sub Taro Ice Cream, -Almond Flakes, +Mango). $9.70. 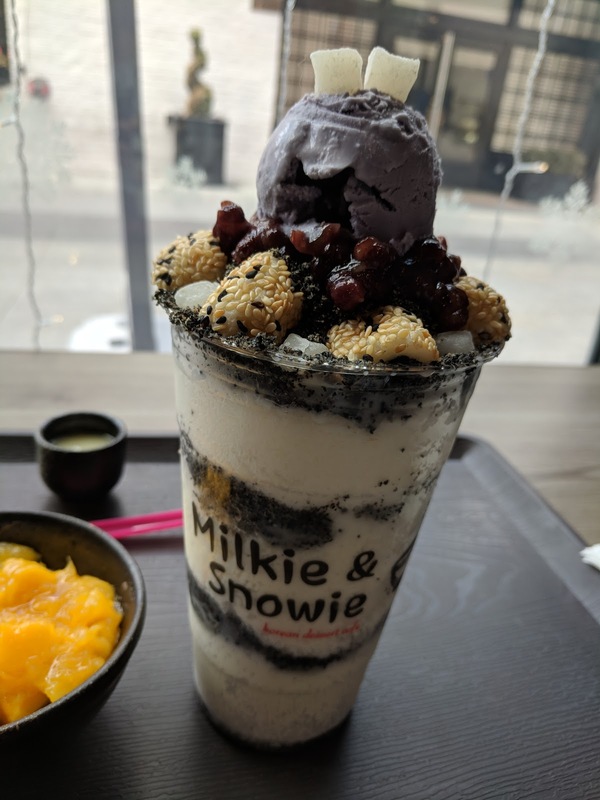 "Shaved snow with layers of condensed milk, black sesame powder and red bean. Topped with mochi, black sesame ice cream and sliced almonds." I modified mine to have taro ice cream instead of black sesame (because I really wanted to try the taro, not because I didn't also want the black sesame! ), to leave off the sliced almonds, and add mango. I actually just wanted to sub mango from almonds, but it was *not* an option to just replace the almonds, but I was told I could have them left off entirely. 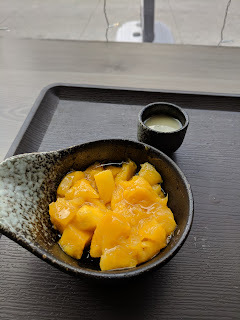 And, I thought the mango would come as part of the dessert, but, instead, it came on the side. Oh well. It came on a tray, and the person making it walked it to a random table and put it down, which was a bit strange, given that I was there waiting to pick it up myself. And I didn't want that table. But, they clearly have a prescribed way of doing things. 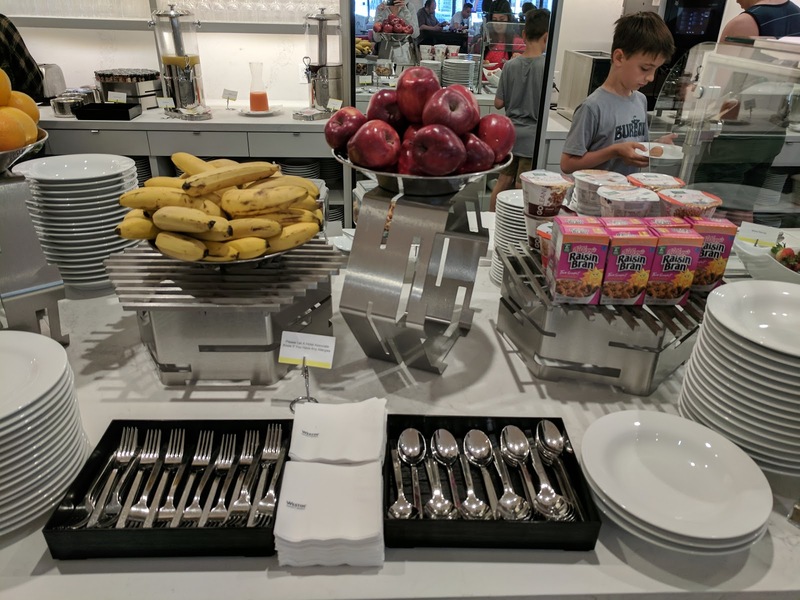 No napkins were provided at the time though, and the spoon was placed directly on the tray. I had to fetch my own napkins, and move to a table I actually wanted. Anyway. Modified Black Sesame Bingsu (close-up). In the cup, a base of sweetened red bean and black sesame powder, a layer of snow, another layer of red bean/black sesame, another layer of snow, another layer of red bean/sesame, another layer of snow, ANOTHER layer of red bean/black sesame (yes, 3 layers snow, 4 layers red bean/sesame), and then a big pile of the sweetened red bean, regular plain small mochi and sesame crusted larger mochi around the edge, a scoop of ice cream, and a garnish of two little mochi. The ice cream comes from Fosselman's, a local creamery based in Alhambra, CA. I've actually had some of their ice cream/sorbet before, I recall a particularly fruity peach sorbet I had at a party that I enjoyed far more than expected since I don't really care for sorbet. I was interested in the black sesame, but, I'm a taro girl to the core, and so I swapped out the black sesame ice cream for the taro. Really, I wanted both, but, the only way I could do that was if I just got ice cream (with toppings), rather than a snow. And I wanted to experience the snow. "Fresh taro root cooked to perfection creates the true flavor of the Pacific Rim." The "snow" was also fascinating though. I hadn't ever had a snow before, and, well, I was blown away. I knew it was going to be fluffy and everything, but, wow. It was insanely fluffy! I honestly thought it was coconut at first, I was really confused why my creation seemed to have very finely shredded coconut throughout. And then I realized, that was the snow! It was remarkable, actually. And it somehow didn't melt? Mind. Blown. It was very refreshing, necessary against the heavier layers. The red bean was fairly standard sweetened red bean. I didn't have it removed because I thought the protein would be good for me, but, I keep not really liking sweet red bean these days, and that happened again. It was sweet, it was mushy, it was eh. And it dominated the creation. With 4 layers and the additional mount on top, it was actually the most generous component, and the one I liked the least. I mostly tried to eat around it, but that was difficult. The black sesame powder was also a dominant element. At first, I didn't really like it. I was rather heartbroken, as that was impossible to avoid. There was ... seriously, more than a cup of it on here total. It was gritty, toasty, a very strong flavor. And there was tons of it. At first the textures just seemed all wrong to me ... light fluffy refreshing snow and then this pile of bitter dirt. It was odd. But it grew on me. And then I discovered that if I added condensed milk, it complimented the sesame perfectly. As did the mochi. So I created some bites that were quite enjoyable, but it took me a while to settle there. And finally, the mochi. The little ones were totally standard froyo shop white mochi. Soft, fresh enough, good enough. The bigger ones I really liked though, the large size made the rice flavor stronger, and the mixed seed crust gave some crunch. So overall, this was a mixed success. I'm really glad I tried snow. Its fascinating. I loved the taro ice cream. I learned to like black sesame powder. But, this wasn't quite the item for me, and I don't see one on the menu that *would* be. I do want a snow element, but, maybe just taro ice cream topped with sesame mochi is my thing? I intended the mango to be part of my creation, but, it was given on the side, since, "not part of the recipe". It was not very good. A generous portion, sure, but it didn't seem like actual fresh fruit, it was ripe, but in a way that seemed like stewed peaches, if you know what I mean, sitting in a lot of syrup. Mushy. Just ... not great. I guess I'm glad it was on the side, as I didn't finish it. The condensed milk I think was intended for the snow? Not really sure. I did try drizzling it over mango, for a "mangos n cream" type of thing, but, it was all just sweet and that didn't work. It did however work great with the bitter sesame powder, and once I got used to the sesame powder, I enjoyed big spoonfuls of sesame powder tempered by some condensed milk. I grew up in a small town in New Hampshire. The only diversity in cuisine we had was "Mexican" (Del Taco) and "Italian" (Papa Ginos). I am barely exaggerating. 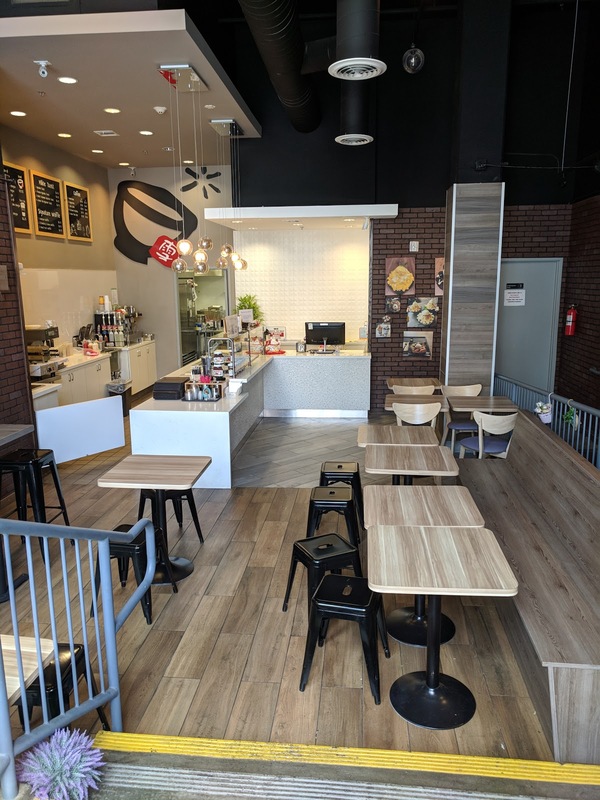 Since I've moved away, there actually have been some new additions in nearby towns, introducing "exotic" cuisine like a thai restaurant, and even a Korean/Japanese place. I've tried the Indian (at take-out only Taj-e-India), I've tried the Nepalese (at Base Camp Cafe), and I have zero desire to return to any of them. On my last visit home, I was driving by and noticed a new place: Bangkok Asian Market & Cafe, the sign said. There were no cars in the parking lot, and it wasn't entirely clear where I was supposed to enter the run down looking building. Undeterred, I pushed on a random door, and found myself inside a tiny Asian grocery store, with a very small counter behind which some food could be prepared. In Lebanon, NH. I looked around, admired the variety of ingredients, and went on my way, vowing to return sometime to try food from the tiny cafe. 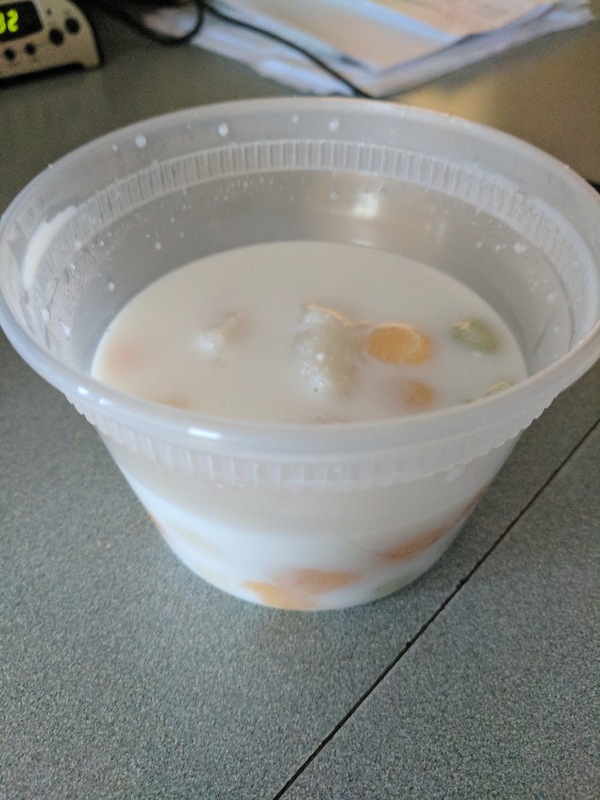 So when I visited next, and realized I had failed to actually make good on my vow, I stopped in with my mother to at least grab a Thai dessert to bring home. I wanted her to get to try something different. We ended up trying more. It was all decent, and I'd like to return at least once more to try more items. And stock up on grocery items you can't find anywhere else around there! I don't have exterior shots, but, the venue is not exactly inviting. The building looks run down, there are no windows in front, and although there is signage, it isn't the most clear. 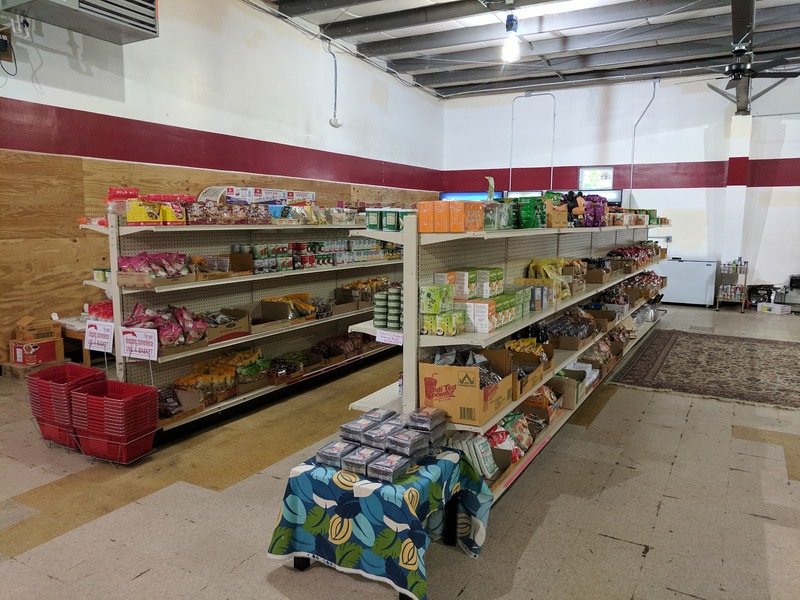 About half the space is filled with two grocery aisles, stocked with a really decent variety of Asian ingredients. 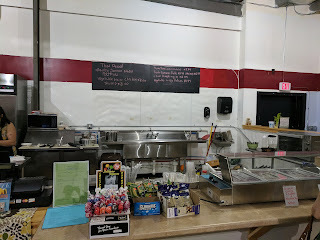 In the back is freezers with frozen items, including mochi ice cream in all flavors. 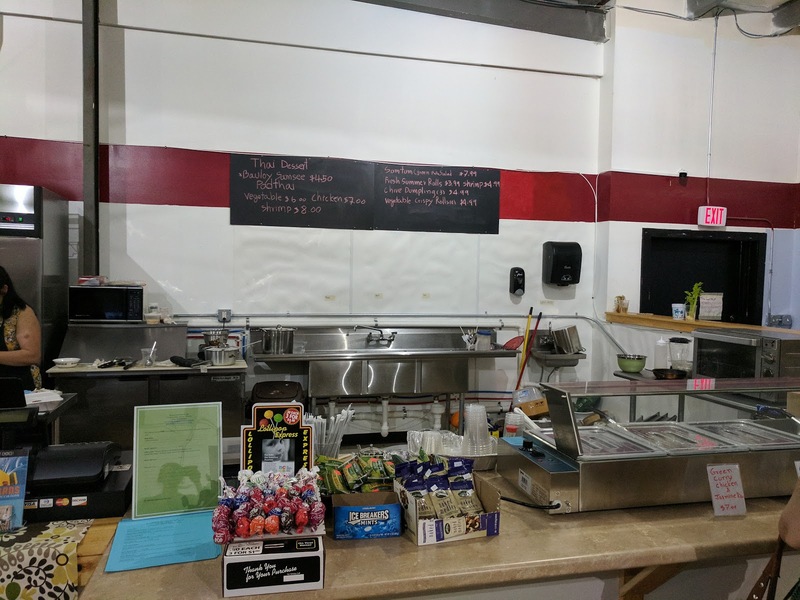 The other area has a counter, behind which food is prepared, and the cash register. There are two curry specials of the day available in steam trays, and everything else is made to order in this tiny "kitchen". 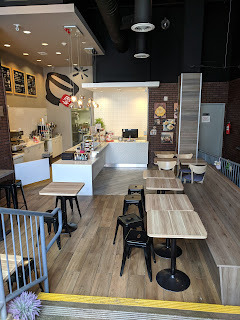 The cafe menu is broken into appetizers, salads, and curries, plus a few drinks such as Thai ice tea and coffee, and made-to-order smoothies. They also feature a daily special (frequently pad thai), and, on my visit, a single dessert. Curries are all available with chicken, shrimp, or veggies, and are served with jasmine rice. The cafe offers all the basics: green, red, yellow, masaman, and panang. We didn't try any curries, but tried an appetizer, salad, and dessert. The appetizer menu has all the Thai classics you'd expect: spring rolls, summer rolls, chicken satay, fish cakes, and chive dumplings. If I were hungry at the time we stopped in, I would have gone for the chive dumplings, but since I was just there to grab dessert, I didn't want them then. 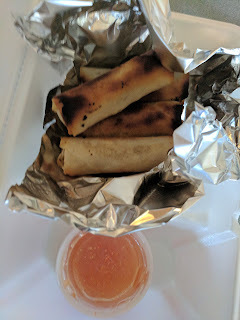 My mom however wanted a snack, so she went for an order of spring rolls. "Crispy baked vegetables spring roll, serve with sweet chili sauce." The spring rolls were cooked to order and came as a set of four. They were a bit burnt on one side. Inside was a lot of vermicelli, and some thinly shredded cabbage and carrots. They weren't particularly good nor bad. I liked the sweet sauce on the side of course. I appreciated the packaging inside foil to keep them warm. On the side was sweet chili sauce. The salad menu has papaya salad, larb (chicken or pork), a bean thread noodle salad, and a few others. I couldn't resist grabbing a papaya salad to have for dinner later. Som-Thom / Green Papaya Salad. $8. "Shredded green papaya, carrot, tomato, green bean, roasted peanut, dried shrimp, lime juice, and palm sugar." The papaya salad was also freshly made ... as in, a legit mortar and pastel came out. The shredded green papaya and carrot were very fresh and crisp. The tomato was good enough for not in-season tomato, and the green beans were the right level of snappy. A good distribution of peanuts as well. 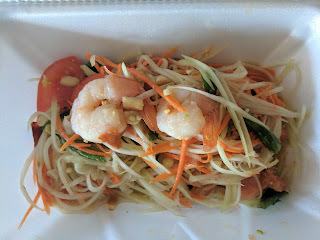 I was surprised to find my papaya salad topped with poached shrimp, given that the menu said it had dried shrimp. Inside my salad was 4 whole shrimp, not rubbery, well cleaned. It also had legit heat to it. There were little chunks of chili in the mix. When you ate one of them, you knew it. The spicing was great, you could taste the fish sauce, and there was a nice level of acidity. Overall, this was a good papaya salad, better than average, and clearly made with care. Not generic, Americanized papaya salad. The market side of the business has packaged commercial desserts in the freezer, but on my visit, there was also a dessert special. (Ok, who am I kidding, I was there to try the dessert, obviously I'm a dessert-o-holic, but I knew it existed, as I had seen the owner post about it on Facebook.) I was told it would take about 15 minutes to make, but I didn't mind. It was my reason for being there, I adore Thai desserts. This seemed to be very similar to a dessert, Bua Loy Kai Warn, I had at Chat Thai in Sydney. This version had three colors of glutenous rice dumplings, green (pandan), orange (sweet potato), and white (plain?). The version at Chat Thai had purple (taro), orange (Japanese pumpkin), and green (pandan) dumplings, which was a bit more colorful with the purple taro replacing the plain white ones here. Since I love taro, I also was also generally happier to have taro in the mix. Colors aside, the dumplings all tasted about the same. The dumplings were a bit too soft for my preferences, and many came stuck together, so not that well prepared. Both versions of the dessert were served in warm coconut milk, a thin broth, not thick like a coconut cream often found in thai desserts. The Chat Thai one was cloying sweet, but this was much better, just thin coconut milk, nice coconut flavor, not too sweet. Both were served warm, this one was actually quite hot, and she warned me to be careful, as it was freshly prepared. But just like the Chat Thai version, I didn't actually like it. Kinda soft, flavorless, mochi-like balls, in tasty enough coconut milk just wasn't very exciting. I gave my mom and bite and she hated it, but I think she was unfamiliar with mochi or glutinous rice based items entirely. However, I salvaged this and turned it into a dessert I really truly loved. Yup, I waffled the mochi balls, and topped it with not only the coconut milk drizzle, but also whipped cream. Read more about that here. Another day, another hotel stay, another executive lounge. So this time I headed to the Westin, Copley Place. It is slightly further away from my office, adding about 3 minutes to my walk, and offering up a totally different route and scenery. 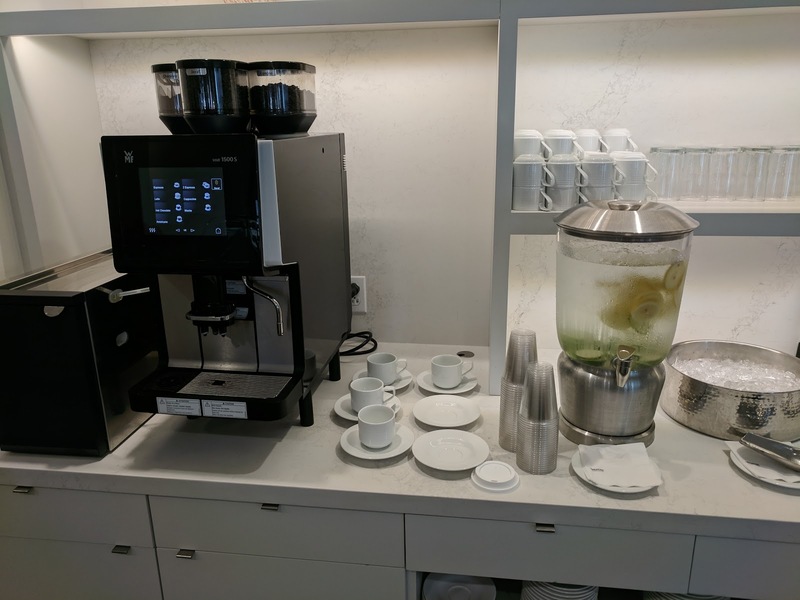 Comparing a Westin and a W is difficult, as they really are entirely different brands, and both of these properties represent their brands really well. The Westin is more classic, a huge hotel, all the amenities you'd expect, older style, more elegant. The W is more hip, full of fun touches, and more personal. They each have their merits. I'll spare you from details about who has the better beds (toss up, W for the bed, Westin for the bedding), better showers (toss up, neither that impressive), more comfortable lounge space in the rooms (Westin), toiletries (Bliss products at the W for sure), access to power outlets (sigh, neither), AC systems (at least you can hack the W one), etc. This is just about breakfast. The most important meal of the day, for some, right? The lounge is a nice looking space, albeit small, albeit on the 5th floor without any nice views. The lounge is newly renovated and quite attractive. 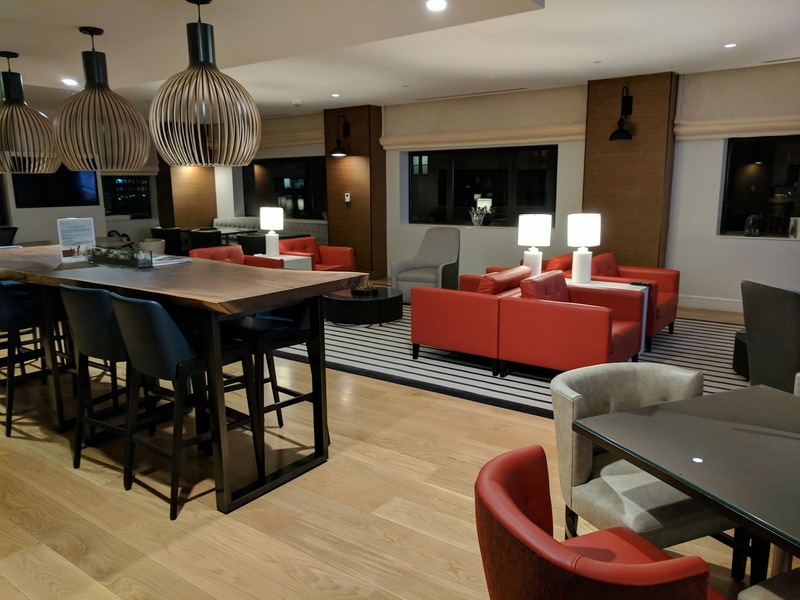 Blonde hardwood floors, dark hardwood tables, red leather chairs, lamps, rugs, nice lines, modern style. Comfortable seating, higher tables, and bar stools along the edge. A buffet breakfast is served in the morning, along with evening canapes, and snacks throughout the day. I arrived too late to check out the canapes, but went to breakfast one morning, and grabbed snacks in the evening. Breakfast is served only until 9:30am during the week, 10am on weekends. 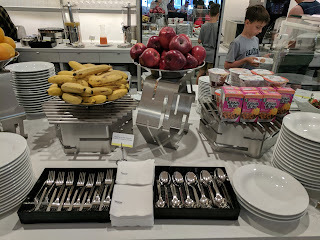 I was traveling from the west coast, and arrived really late at night, so, I barely made it in before the cutoff for breakfast. Minus a point for this, but 9:30am is a pretty standard cutoff time for weekday breakfast. 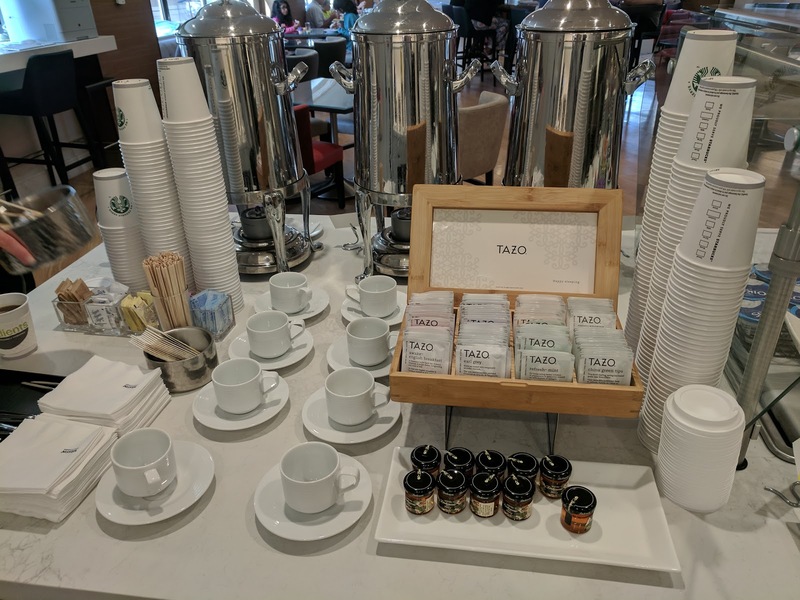 The espresso machine was self-serve. Points for that. It also made *really* good espresso drinks, both regular and decaf. More points. But, it was only on during breakfast hours. Want an Americano at 9:31am? Out of luck. 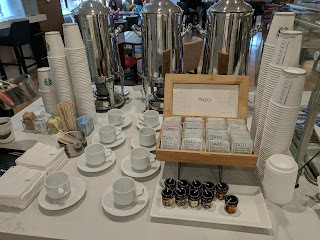 Tea drinkers had a plethora of Tazo tea bags to pick from, with a vat of hot water on the side to serve from. 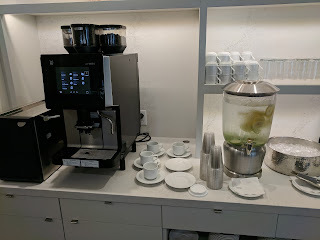 There was also regular and decaf brewed coffee self-serve, both of which were horrible. Weak and acidic all at once somehow. The espresso machine was far superior. 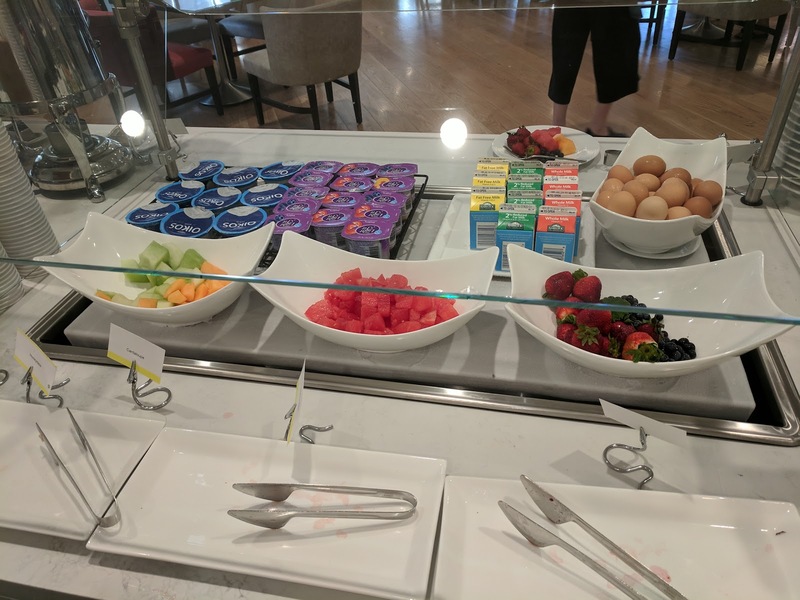 The continental selections began with classics - fruit and cereal. Whole apples, oranges, and bananas in bowls, plus raisin bran and Kashi cereals (Heart to Heart (oat flakes & blueberry clusters, honey toasted oat cereal) and Go Lean Crunch!). Points for Kashi rather than just the whole Kellogg's lineup. Bonus points for not having annoying cereal dispensers. I was happy to see this, as I assumed this would be continental only. 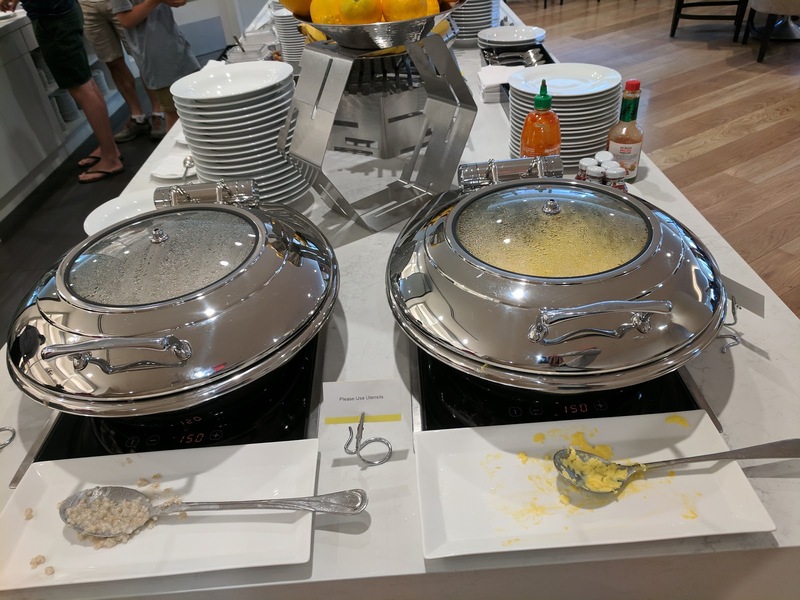 However, the options were dried out extremely sad looking scrambled eggs and oatmeal. I tried the oatmeal, it was gloopy, mushy, and flavorless. Mix-Ins: Nuts, Dried Fruit, Brown Sugar. 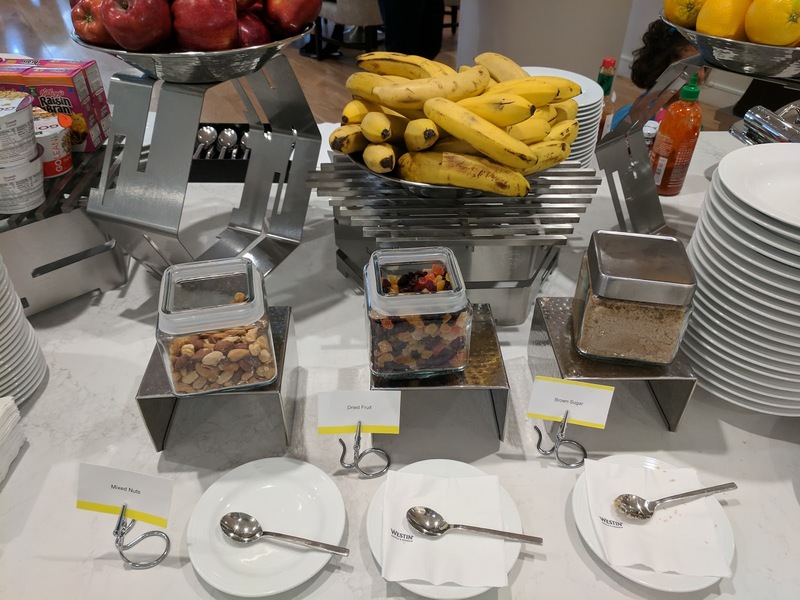 To add to your oatmeal, or perhaps just to munch on, there were mix-ins, including brown sugar, bits of dried fruit and raisins, and mixed nuts. I was excited by the fruit and nuts, but neither turned out to be great. Yes, the dried fruit had things like pineapple and mango, tiny cubes, but it just wasn't very good. The mix was mostly raisins (multiple colors) and cranberries. Same with the mixed nuts. They looked promising, were salted, had brazil nuts, pecans, multiple types of almonds, and more, but again, just, not really any flavor. Yogurt, Milk, Eggs, Cut Fruit, Berries. Next up, a cold well. Here you could find hard boiled eggs, milk cartons (regular, skim, 2%), Oikos greek yogurt, Dannon Light & Fit yogurt. On the other side, cut melons, including watermelon (danger! ), and berries (strawberries and blueberries). 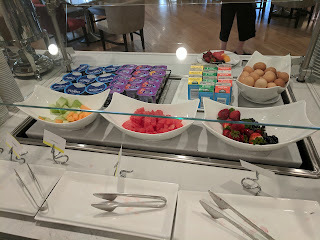 I went straight for the berries, even though they were next to the watermelon. The blueberries were mostly good, although there were some in the mix that seemed rotten. The strawberries were bright red, looked great, but ended up being incredibly watery and flavorless. 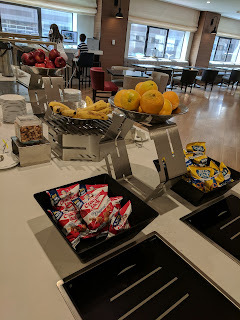 Points for having berries, but these weren't very good offerings. 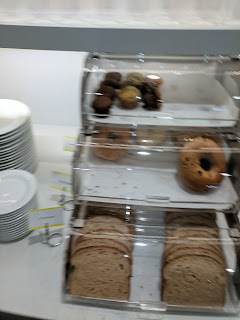 The final station was breads, including sliced bread for toast, bagels, and mini muffins. On the side was a toaster and a variety of spreads (butter, peanut butter, cream cheese, assorted Dickinson's jams, and Welsh's low sugar grape jelly). The muffins were mini muffins, and didn't look good, but, you know me and baked goods. I had to try. I tried 3: lemon poppyseed, raisin bran, and cinnamon. I skipped the blueberry and another dark colored one. They were nothing special, fairly dry. The cinnamon topped one was the worst, super plain, sweet almost like a boring frosting-less cake, with just a little cinnamon on top. The raisin bran was a bit better, I liked the oat flakes on top. The lemon poppyseed was by far the best, a nice lemon flavor, and tons of poppyseeds for some texture. It was my favorite, although, not special really. Throughout the rest of the day, the lounge is open for snacks and soft drinks. It is open until 11pm, which I was very happy about, given my late arrival. I was able to swing in and grab sparkling water and popcorn at 10:30pm! Earlier in the evening is a canape hour, but I missed that. The snack food setup had the same whole fruit, nuts, and dried fruit from breakfast, plus bags of Rold Gold pretzels and Cracker Jacks. 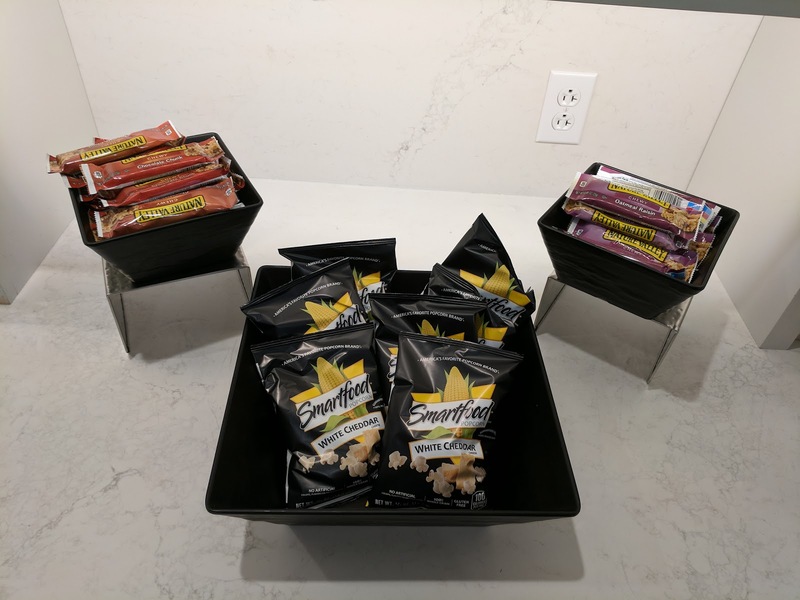 There was also Smartfood popcorn and two types of Nature Valley granola bars. 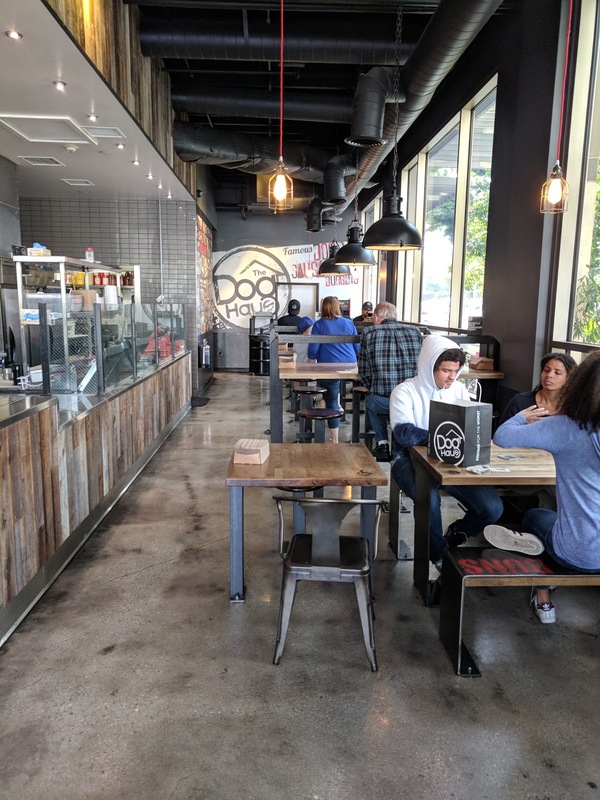 Dog Haus is a ... a hot dog chain, essentially. They specialize in gourmet hot dogs and sausages, although they also offer burgers, fried chicken, and standard sides. Their tag line? "The Absolute Würst". Tee hee. 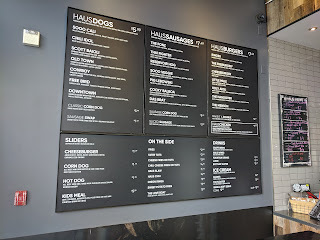 Dog Haus opened in 2010 in Pasadena, CA and has since expanded to more than 30 locations spanning 9 states. And there is a reason why. 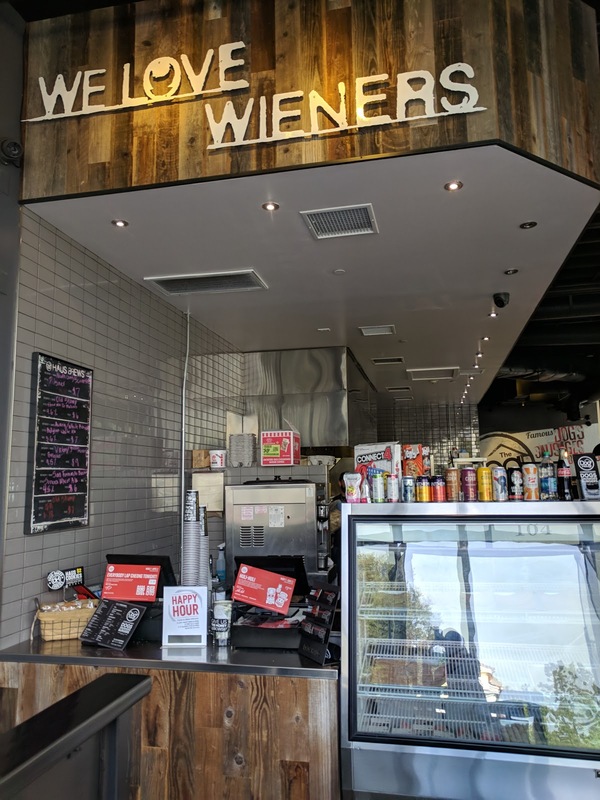 The concept sounds simple, hot dogs right, but they do it right. Quality ingredients, cooked to order. The hot dogs are all beef, the sausages are hand made with no added nitrates, etc, the burgers are 100% Black Angus, the chicken is hormone-free. Oh,and the kicker? The buns they use for everything are ... King's Hawaiian rolls! I'll admit, I adore a good hot dog, but it was the King's Hawaiian rolls that drew me in. I really, really love the soft, sweet, fluffy bread. I visited one of the two locations in Pasadena, in a not very interesting area, nearby CalTech where I was helping at a recruiting event. The other Pasadena location is in Old Town, and features a Biergarten, and looks much nicer. Outside has plentiful seating on metal tables on the sidewalk, in an quasi-enclosed area so you could bring booze out there, but not onto the "public" street. 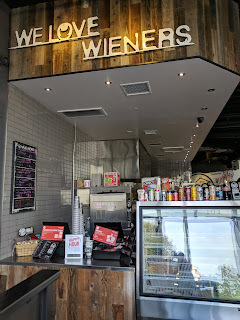 Ordering is all done at a register from a not very engaged employee, where chilled sausages and the alcoholic drink selection are displayed. The drink selection was kinda awesome, they had plenty of non-beer things including even a boozy nitro cold brew! What??! Once you order, you are given a buzzer. I was handed mine without a word. Not the friendliest human. On the plus side, the "We Love Wieners" sign did make me laugh. Lots of seating is available inside as well, nicely lit, etc. All orders are made to order, and you can watch items being prepared if you wish. I loved seeing the ridiculous quantity of King's Hawaiian that they go through! 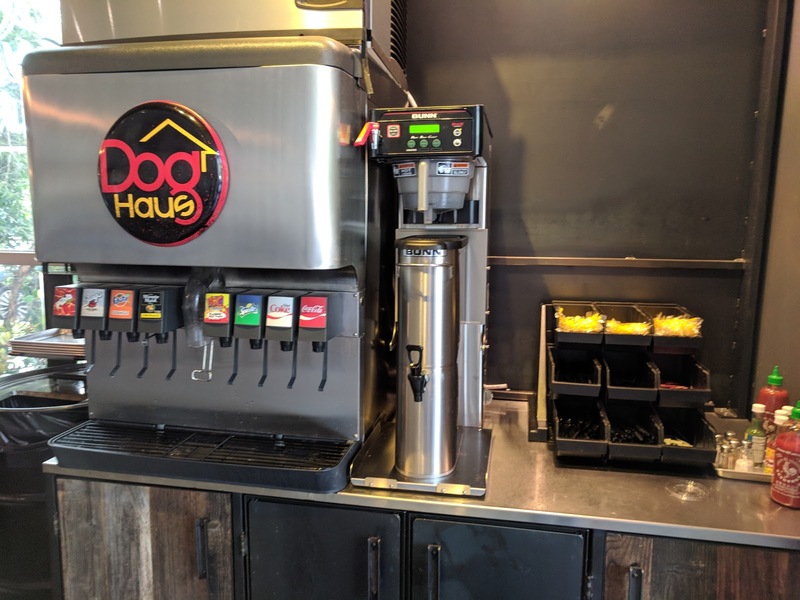 Soft drinks, plastic utensils, and hot sauce are self serve. 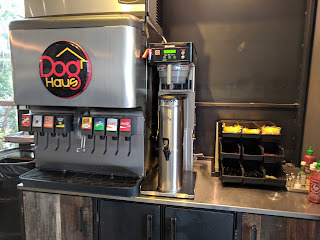 Ketchup and mustard, in HUGE dispensers, are located right up at the area where you pick up your order. So, the menu. A slew of different "HausDogs", with some pretty fun toppings. Many are bacon wrapped. They have cheddar cheese sauce, caramelized or crispy onions, flavorful aiolis. Oh yes. You can get any of these hotdogs made with a sausage of your choice isntead, or just customize your own too. Oh, and they have housemade corn dogs, in a root beer batter. Oh my. 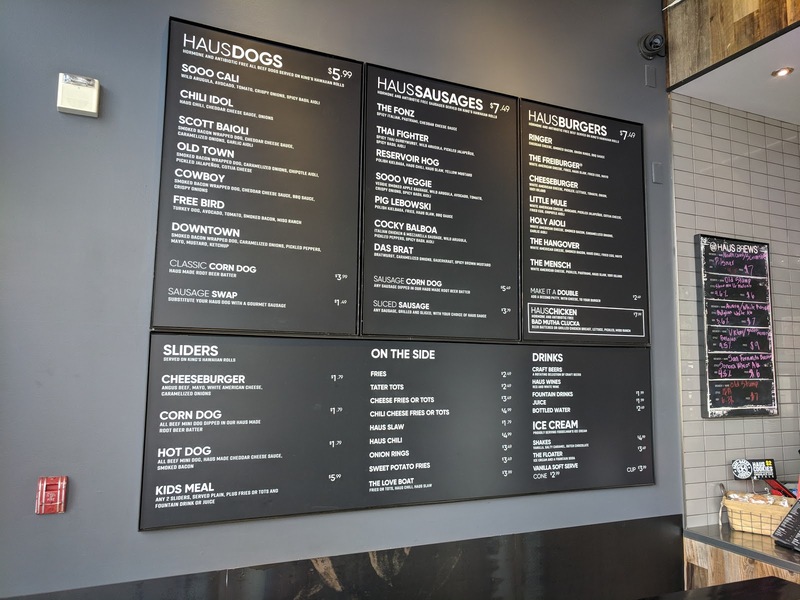 Next is the signature "HausSausages", ranging from spicy italian to thai currywurst to polish kielbasa and more, plus of course some chicken sausage and veggie sausage options. And yes, you can get any sausage made into a hand dipped corn dog too, or top it any way you want. Then there are "HausBurgers" and chicken burgers (simply grilled or beer battered and fried). They also make sliders, using a single King's Hawaiian roll each, available as simple cheeseburger or hot dog, plus a mini corn dog. Sides have all the classics: fries, tots, cheese fries, chili cheese fries, sweet potato fries, chili, slaw, onion rings, etc. You can get crazy and go for the "Love Boat", with the fried base of your choice, topped wit chili, cheese, and slaw. Happy Hour is Monday - Friday, 3-6pm, and features $1.25 sliders and fries or tots. Not that prices are usually expensive at all, but, wow, what a deal! Hot Dog Slider. Happy Hour. $1.25. "All beef mini dog, haus made cheddar cheese sauce, smoked bacon." 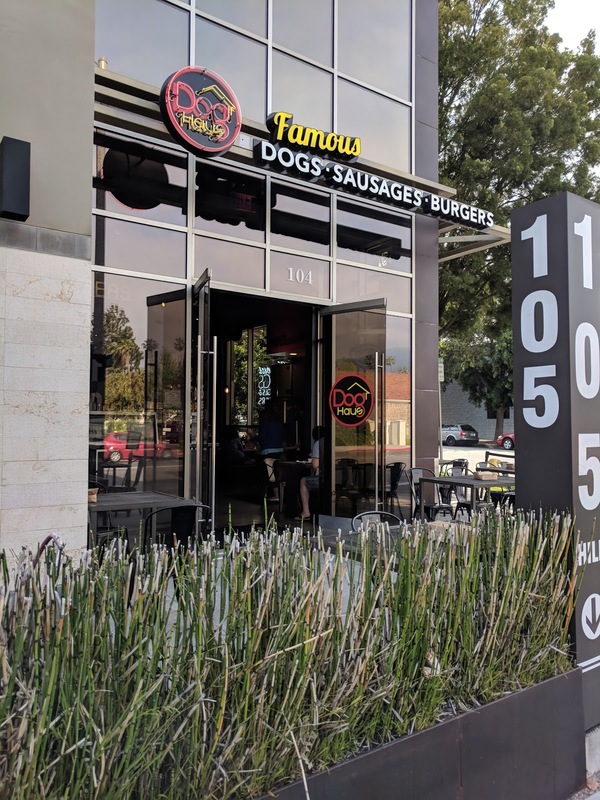 Since it was actually only 4:30pm and I wasn't ready for dinner, but wanted to get the chance to try out Dog Haus, I went for the hot dog slider. It was made to order, and came quickly. I ordered it unmodified, although those aren't necessarily the toppings I would have picked. It was adorable. And it was a very well executed slider. The bun, perfectly toasted. Not burnt at all, just crisp enough, and the toasting really enhanced the buttery quality of the Hawaiian roll. 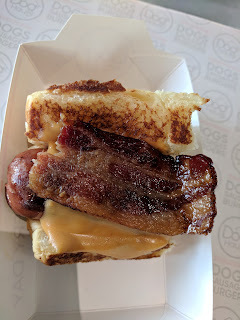 The hot dog, juicy, and lightly charred. Just enough to make the skin crisp, yet retain all the juices. Exactly how I like my hot dogs. The cheese sauce? You guessed it, perfectly melted. Enough to smother the hot dog, but not overwhelm. The bacon? Yup, perfectly crisp. No flabby bacon here. Execution-wise, this was just spot on. A little slider, only costing $1.25, and yet made with such care. Hot Dog Slider: Side Profile. And how was it, other than being really well prepared? I adore King's Hawaiian buns, and the soft sweet bread really was excellent with the hot dog. We need more uses of these buns in general, and they certainly beat a boring hot dog bun. The cheese sauce was tasty, creamy, cheesy. Not *too* fake tasting, just fake enough to be tasty, if you know what I mean. It went really well with the bread and the bacon. I didn't love the hot dog though. 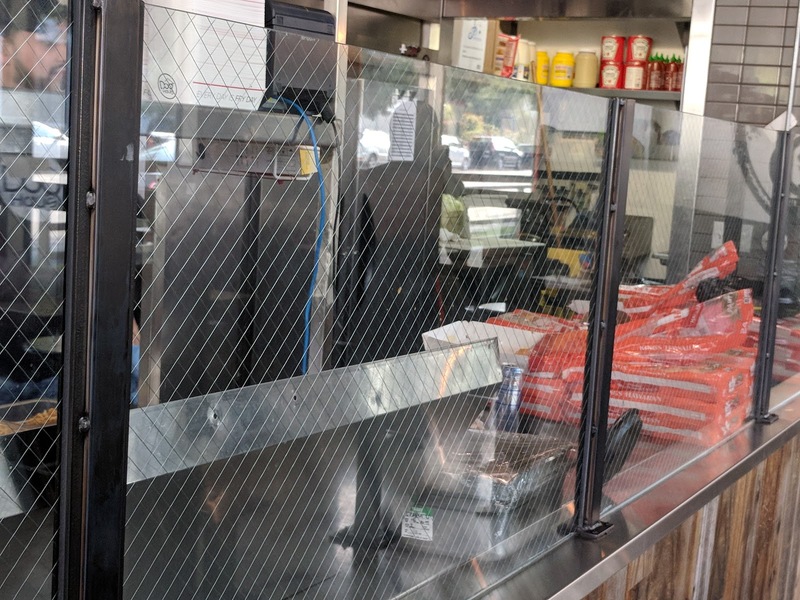 Not because there was anything wrong with it, as I mentioned, it was really well prepared, I just ... wasn't actually feeling the all beef hot dog. I really prefer turkey dogs (which they have in full size only). 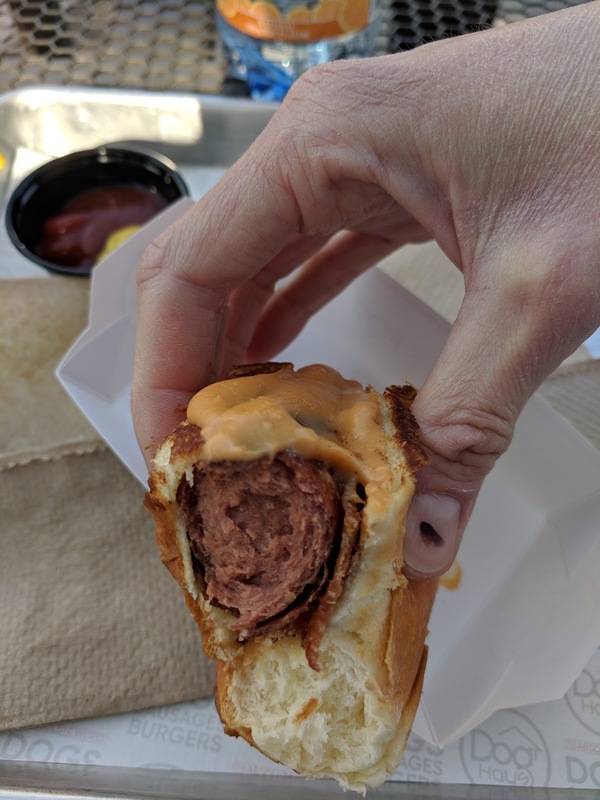 I still enjoyed my snack, but honestly would have liked the bun/cheese/bacon without the hot dog more.